Behind any vision for a church must be a vision of God. Our vision for the future is of continuing development and growth; a journey of exploration and of new understanding, reflecting an understanding of God. God does not ask us to remain the same, but to step out on a journey with him that involves new discoveries and endless possibilities. That vision is increasingly inclusive, involving a wider group of people across the parish and welcoming others to join us. 1. “God is good, all the time” At the centre of our life together is our worship. There are opportunities to worship in a variety of styles; everyone (of all ages) is welcomed and included. 2. “Everyone matters” St James is a family. We nurture the young and the young-in-faith, and each of us is always learning and growing. We care for one another - from experiencing an initial welcome as a newcomer, to being encouraged to play a full part as an established member of the family. We support one another as we can. 3. “Not a cruise ship but a lifeboat” We are outward-looking. We have identified our neighbours’ needs and are offering our time and putting our gifts into action. We serve as individuals, and together as a church. This is our vision of the church we believe is God is calling us to be - and will be the measure of our ‘success’ in the years to come. The primary object of the PCC is the promotion of the Gospel of our Lord Jesus Christ according to the doctrines and practices of the Church of England. St James’s PCC has the responsibility for co-operating with the incumbent in promoting, in the ecclesiastical parish, the whole mission of the church – pastoral, evangelistic, social and ecumenical. Sunday worship has been provided throughout the year. The 11.00 service continues to run since its inception in May 17 and has grown to attract a regular group of families, who are taking more responsibility for the running of the service. 8.00 and 9.30 have continued. During most of 2018 the church was without a regular organist, but was supported by a number of visitors. Martin Hinckley managed the choir, which grew in number through the year. Midweek, the morning office has been said daily (Mon, Wed, Thurs, Fri) and Communion celebrated (Tues – once a month followed by coffee). Baptism, Weddings and Funerals (including Thanksgiving / Memorial services) are provided for the members of the parish. The church hosts numerous school services at Christmas and welcomed school / uniformed organisations through the year. A team of visitors together, with clergy, conduct pastoral visiting. There are preparation groups for baptism and weddings. As well as post-funeral support, all bereaved families are invited to an annual All Souls remembrance service. Children and young people have their own activity groups during the 9.30 service: Shell Seekers. In the summer a group for young people, organised around social activities and food began. Our biggest outreach is the Spire magazine. It is delivered free to 450 homes and is available from many High Street shops. During this year the church began delivering a ‘What’s On’ leaflet every quarter to homes in the parish. The website and social media offer further means of contact with the public. There are a number of ways that we seek to build up the church’s social life, and community. Refreshments after the 9.30 and 11.00 are very important in making new people feel welcome and enabling members to talk to one another. Through the year there are a number of other occasions including; St James’s Day, breakfast on Easter day, Harvest Lunch and wine after the Carol Service. Special social events in 2018 included a Quiz Night, a Wine Tasting Evening, a Late Summer Supper and a concert with singer-songwriter Alistair Griffin. Church members are encouraged to think about how their Christian faith can be taken into their working / family life. Approximately monthly someone will speak about ‘This Time Tomorrow’ at the 9.30 service; this replaces the long-running ’Faith at Work’ group. St James’s has a strong tradition of supporting other agencies in relieving need and Christian mission. There is an annual programme of fund-raising projects e.g. Lent Appeal, Christian Aid Week and Harvest appeal. Gifts of food are sent on to the Food Bank; unwanted tools are passed onto to TWAM. The church supports Fair Trade: by providing Fairtrade refreshments, and a monthly stall. St James continues to be a member of Churches Together. Parochial Church Council Activities The full PCC met eight times during the year with an average level of attendance of 70%. Committees met between meetings and reports of their deliberations were received by the PCC and discussed when necessary. Properties The major work this year was on refurbishing the church hall: the floor was re-sanded, safer heating was installed and the toilets all redecorated. Sunday Attendance There were 167 names on the Electoral Roll at the revision in March 2018. Of these 100 were resident in the parish and 67 were non-resident. The attendance on a usual Sunday was estimated to be 86 adults and 19 under 18s. Teaching and nurture In Lent 2018 a course based on ‘The Purpose Driven Life’ was run on the subject of prayer, with a light meal, in the hall. Two small groups continued, meeting in members’ homes. Quest was a nurture group – the material was formed on the basis of questions people brought to the group. In Advent there was a recommended book to read. Charities Support Team 2018 was the first year where we asked the congregation to support our chosen charities rather than the money coming out of church income. The Lent Appeal raised £2,733 for the Church Mission Society (for David and Shelley Stokes in northern Argentina). During the year various events raised a total of £2,512 for four charities: Bishop Wand School, London Churches Refugee Fund, Tools With A Mission and ALMA. The Harvest Appeal raised £1,152 for The Upper Room. Excluding Christian Aid Week (£3,733) and The Children’s Society (£1,155). In total we gave £18,620 in charitable grants which included £10,000 paid to St Richards Church, Hanworth funded from the legacy received from the late Revd Betty Stewart. Pastoral Care Visitors have been trained and organised to offer pastoral care. The aim is to provide a link with the church for those parishioners who are unable to attend or are in need of support at a particular time. Visiting the elderly and the families of those being baptised are particular foci. Visitors have undertaken safeguarding training through the year. A simple record of the visits is maintained for safeguarding. Children and Young People Shell Seekers (Sunday school) has run most term-time weeks at 9.30. The group is mostly Y6 and above. 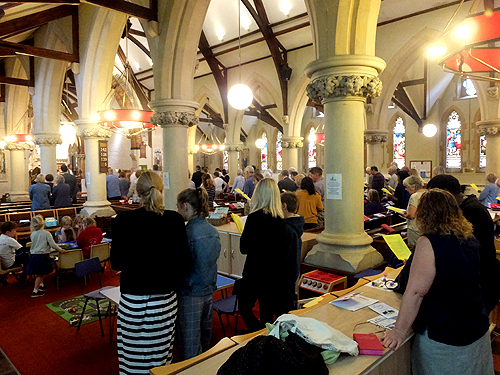 A good number of children come with their parents to the 11.00 services. The Ark Playgroup continues to run on Monday mornings in term-time and attracts up to twenty families; as well as free play there is a story / song time. A Children’s Ministry Team co-ordinates the various activities. It has also formalised a recruitment process for volunteers. A Children and Families Work leader has been appointed. The vicar has good links with a number of schools and takes assemblies at three regularly. The Children and Youth Worker, with volunteers, ran an after-school club for half a term in the summer. Socials St James has continued to develop its social aspect. Refreshments after the 9.30 service, now extend to the 11.00. Prior to Lent, a popular quiz night was held in the hall. St James’s Day service was followed by a barbecue served in the vicarage garden. The Harvest meal brought people together over a common meal, with a number of people providing entertainment. There was also Teddy Bear picnic in the summer. After a Tuesday communion, once a month, coffee and tea are served to encourage companionship and support. The Film Club / Pop Up Cinema has offered shows throughout the year. Adult films have alternated with children’s ones. Numbers are gently rising; children’s shows are most popular. 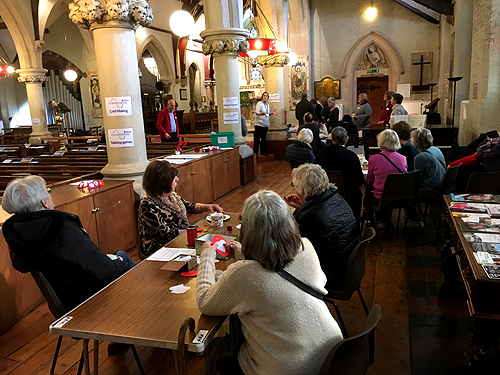 On the day before ‘St James’s Day’, 30 June an invitation event (Open to View) was organised for the community: an organ recital, tea and cakes, a bottle stall, a Traidcraft stall and tours of the church and the tower and a children’s film. The experiment was considered very successful as there were a good number of visitors for this the first time. The Spire magazine continues. One testimony to its popularity is the increasing number of copies that are taken from the Post Office, another would be the positive response to a financial appeal. 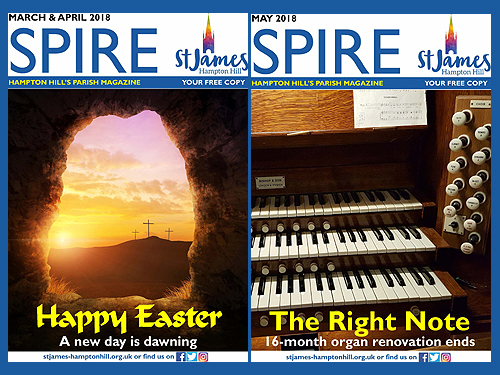 The PCC agreed to extend the Spire’s reach by funding an extra 100 copies for each issue, for systematic distribution around the parish. In the New Year Connections an activity based group for people available in the midweek daytime began. This meets monthly in the church, church members and visitors have attended. There is now a Hearing Aid clinic facility. St James’s has been part of the ecumenical team providing services at Laurel Dene Residential Home and offered to take extra ones at festival times. As part of Churches Together, Hot Cross buns were assembled in the hall for Holy Week. Our closest neighbour is the United Reformed Church. We shared a Good Friday and Remembrance Sunday service with them.